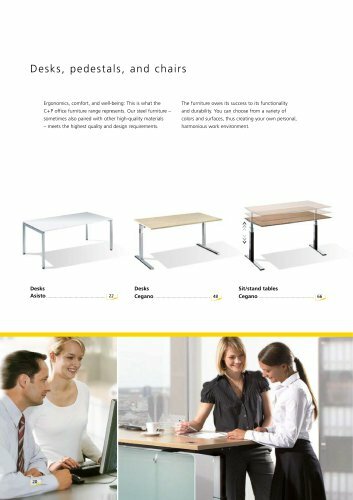 Des ks , p e de st a ls, a nd ch a i rs Ergonomics, comfort, and well-being: This is what the The furniture owes its success to its functionality C+P office furniture range represents. Our steel furniture – and durability. You can choose from a variety of sometimes also paired with other high-quality materials colors and surfaces, thus creating your own personal, – meets the highest quality and design requirements. harmonious work environment. MCPB plate Solid-core panel The tabletops are available in different designs. Please also note the respective pages with tables. Melamine coated particle board (MCPB), with melamine resin surface on both sides Top made of HPL (High Pressure Laminate) with decor surface on both sides Width Depth A drawing or layout plan is required when ordering desk combinations. Height adjustment The Basic height adjustment is available as a cost-effective option. By seamlessly moving the sturdy plastic sleeve, the desk can be adjusted in height from 680 to 780 mm. The Comfort height adjustment in 10 mm steps is especially easy to operate and is available in the often requested adjustable height of 620 - 850 mm. With the exclusive crank- height adjustment, you can adjust the height of all four table legs evenly at the same time.